Girls’ Clubs is all about—well—girls! 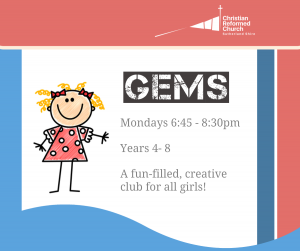 Attention all girls from Grade 4 – Grade 8…..
GEMS Girls are active, imaginative, and unique! They are passionate! And GEMS offers them the perfect place to learn and grow as they discover who God created them to be. We would love you to come and join our great group of girls on every Monday night during the school term. Our mission is to bring girls everywhere into a living, dynamic relationship with Jesus Christ. Like to see what we do? Check out the GEMS Photo Gallery! Like to know some more? Contact us here.